In 2013 I read about Soylent, a "nutritionally complete" meal replacement beverage invented by a software engineer, who started a 30-day experiment to see if he could survive on the stuff. His experiment morphed into a crowdfunding campaign with a feed-the-world-cheaply theme and he raised millions of dollars to start mass-producing it for sale. Do people need "real food" to survive and thrive, or can we break food into its macro- and micronutrient components and reassemble those pieces to create something equivalent? Possibly better? A lot of people were intrigued by the same question and the "powdered food scene" seemed to grow a lot in 2013 & 2014. The buzz-phrase "nutritionally complete" kept popping up. As it turns out, Soylent (the company) hosts a recipe section on their website where users can submit and review recipes. I found one called Schmilk Chocolate that I thought I'd try. It uses whole milk as a source of fat and protein. I made a batch and had it for breakfast every day for a week. It was pretty good! Bland, but not offensively so. 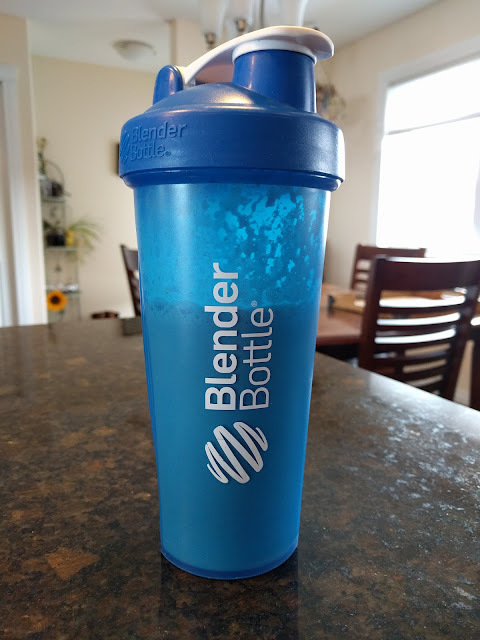 Since early summer 2015, I have been eating/drinking this homemade Soylent every workday for both breakfast and lunch. For supper and meals on weekends I have "real food". I have observed no ill-effects whatsoever (including excess flatulence, which some Soylent users had trouble with). Easy to make. I mix the powdered ingredients with whole milk a meal ahead; the consistency is better if it sits in the fridge for a while. Easy to measure (12.6 grams of powder + 100 ml of whole milk = 108 calories. Scale however is appropriate. I started drinking 670 calorie portions, then 550, currently 450). Easy to consume - you just drink it! Tastes okay. Hard to describe; it's so bland that there are not any defining offensive flavours. The balance of fat, salt, and everything else seems to tell the body "this is good". I usually add an espresso shot for flavour. Makes me feel satiated and satisfied until the next meal. Now that I'm basically at my goal weight, I don't think I am going to stop with Soylent any time soon. It's a part of my routine, and something I miss if my routine is interrupted. Most ingredients can be found in health food stores, all can be found online. Mix all dry ingredients ahead of time. 12.6 g powdered mixture + 100 ml whole milk = 108 calories. Recommend mixing at least 1 hour before consuming for better consistency.